This Kit includes the USB Link 2 Adapter along with the JPRO Fleet Diagnostics Software. Flexible configuration supports wired or wireless* connectivity. Class 1 Bluetooth* provides up to 100 feet of wireless freedom Works with OEM software application and comes complete with a 6 and 9 Pin Y-Cable to connect to the truck, a USB cable to connect to the PC, and a durable carry case to keep your adapter protected and organized. The USB Link 2 is a fully RP1210A-compliant vehicle adapter designed to withstand the rigors of the service bay environment, and provides connections to the CAN/J1939 and J1708/J1587 vehicle network through any Windows 2000, XP application. JPRO® Fleet Diagnostics is a comprehensive vehicle diagnostics application that provides diagnostic and troubleshooting information about electronic components on the vehicle. 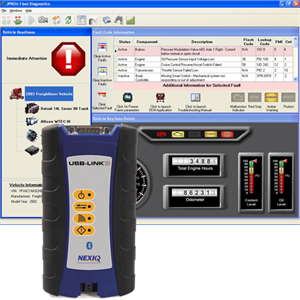 It supports all standard SAE J1587/J1708 and J1939 messages, parameters, and fault codes.